More than 3,500 schools have switched to Picaboo Yearbooks. It’s easier, less expensive, faster and the same print quality. You often don’t know the true cost per book. Our pricing is totally transparent – never any hidden fees. You are often charged without knowing. Only pay for what you sell. You often end up with inventory of books you didn’t sell. Only have one deadline, and that’s the time you place your order. You must submit finalized content multiple times throughout the year. Your spring activities are missed. No class or extensive training required. Steep learning curve, often requires class. You pick the store name and URL, change pricing any time and access real-time reporting. Administrative hassle to setup yearbook store. No access to change site. 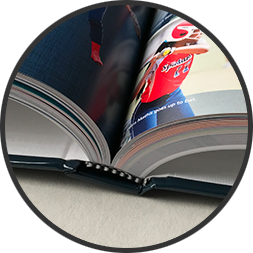 Our yearbooks are printed using the latest printing technology on high-quality archival 100lb paper and professionally bound to the same standards of traditional yearbooks. Schools throughout North America sing our praises! Get inspired. Make it happen. Skipple is the fun way to crowdsource photos for your yearbook or other school publication. Who says your photographers can’t be everywhere at once?